As part of a project called Coastal Settlements at Risk, in September 2002 Ilan Kelman completed his PhD dissertation on Physical Flood Vulnerability of Residential Properties in Coastal, Eastern England. The dissertation was accepted in February 2003 without any changes required. A creek flows through a house in Malton, North Yorkshire, on 8 November 2000. 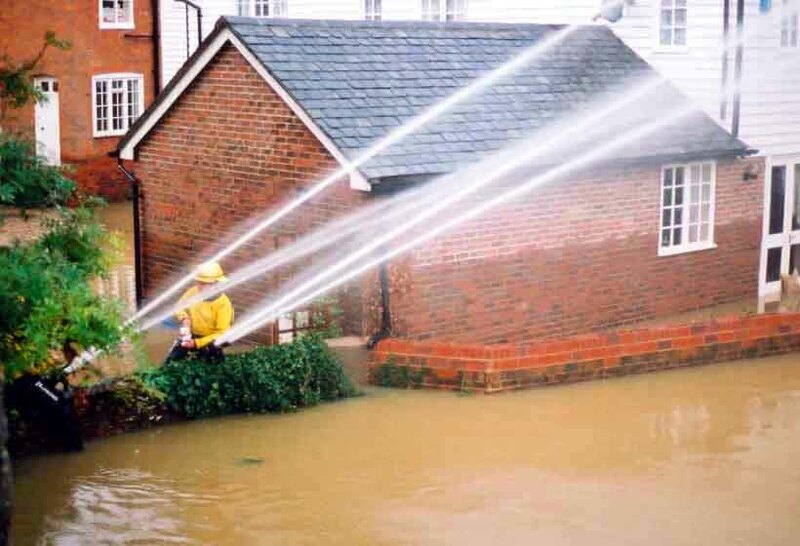 Floods in England during Autumn 2000. The project was part of the Cambridge University Centre for Risk in the Built Environment (CURBE) as a joint endeavour between the Martin Centre (Department of Architecture) and the Cambridge Coastal Research Unit (Department of Geography). The entire project was kindly sponsored by Halifax General Insurance Services Limited. Special thanks to the numerous people on this planet who provided much-needed sources, guidance, and advice along with the researchers and practitioners whose work preceded this project. Several extreme weather events have caused large-scale losses across the U.K. Examples include the windstorm during the Christmas and New Year period in 1997/98, the floods along inland rivers in central England in April 1998, and the storms and inland floods across the U.K. between October 2000 and February 2001. Each of these events caused several fatalities, damaged hundreds of millions of pounds worth of property, and caused severe disruption to society. History illustrates that many more severe events have occurred in the past and the current state of rapid, global climate change is expected to produce more severe and more frequent extreme events in the future. Yalding, Kent in southeast England was inundated in autumn 2000. The east coast of England is particularly vulnerable to storm surge flood events exacerbated by sea-level rise and large-scale land subsidence. East coast storm surges have been extremely devastating in the past, such as the events of 31 January to 1 February 1953 which killed more than 300 people in the U.K. Sea defences in eastern England were raised and strengthened after the 1953 event, but they are nearing the end of their 50-year lifetime. Partly due to the feeling of being protected by these sea defences, coastal development in England has been rapid. The number of people and the value of property highly vulnerable to a major storm surge event in eastern England is far greater than in 1953. 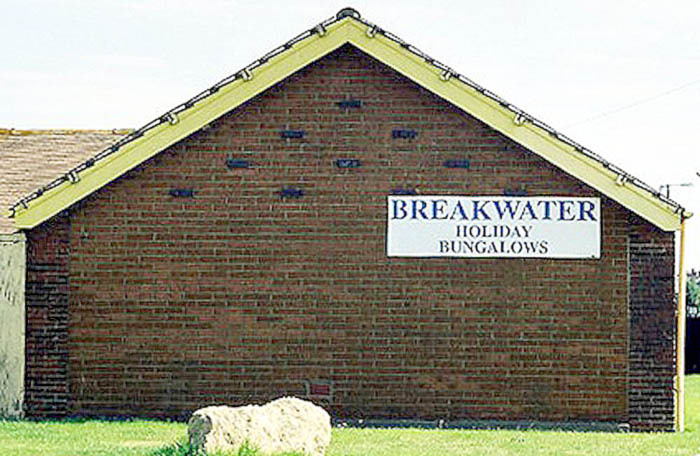 A recent development of bungalows with an ironic name sited just behind the sea defences near Trusthorpe between Maplethorpe and Skegness in eastern England. This study contributed to the understanding of risks to the built environment from natural hazards by assessing the vulnerability of residential buildings to the hazards associated with a major North Sea storm surge. 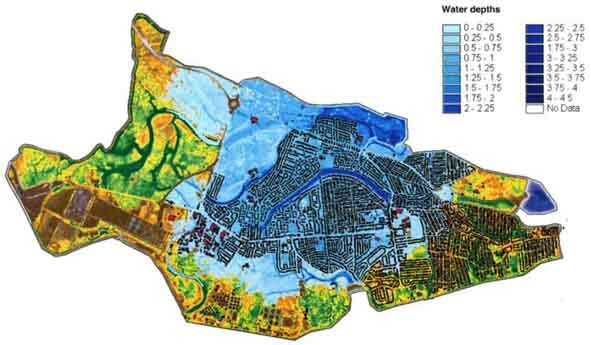 By combining detailed analysis of the buildings in specific case study sites with sophisticated hydrodynamic modelling of potential storm surge events, the research identified features which determine the vulnerability of residential dwellings to flood damage. Risk management strategies were proposed and decision-making tools were developed. Case study site selection focused on urban sites vulnerable to flooding in coastal, eastern England. Criteria considered included the hydrodynamic environment, the residential building characteristics, the availability of required data, and the disaster history of the location. Kingston-upon-Hull, Humberside. 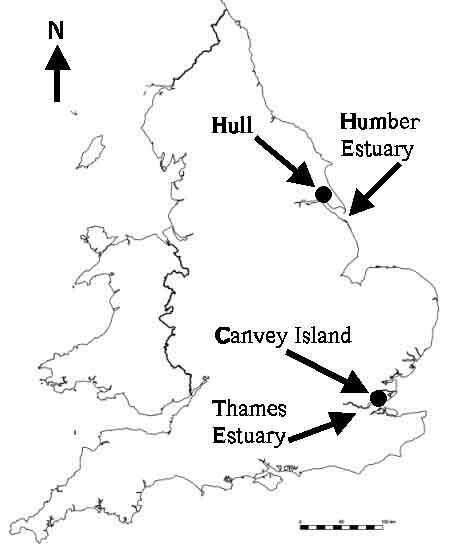 A shallow estuary with a large tidal range, susceptible to flooding from the Humber Estuary and the River Hull. Canvey Island, Essex. An extremely flat and low-lying island site with many residential areas lying approximately 3 m below the mean high water level. Map indicating the case study sites' locations. The research at the Cambridge Coastal Research Unit (CCRU) developed an integrated modelling strategy for the investigation of the physical susceptibility of each case study site to flooding. The model considered the combined effects of astronomical tide, storm surge, wind-wave processes, non-linear interactions and the physical environment of the coastal zone and is capable of representing both the generation of a flood wave and its propagation inland. Flood scenarios were developed for a wide range of meteorological events. Previous attempts to model coastal flooding have either employed a complex (dynamical) representation of the storm surge with no explicit representation of flooding and drying (operational Storm Surge Models (SSM)) or a dynamical representation of flooding with a simple (statistical) representation of the storm surge (e.g. insurance industry models). Both of these approaches have significant disadvantages. In particular, although operational SSM have provided some useful data on sea state conditions for flood warning and coastal engineering, they remain unsuitable for storm impact studies, which require detailed information about the flood depths and velocities that are likely to be experienced inland. In contrast, while insurance industry models have been designed specifically to predict flood losses in the coastal zone, they have, at best, not been able to fully capture the complex hydrodynamic processes that operate during a storm surge and, at worst, completely ignored the important role of dynamical interactions between floodplain boundary conditions and flow characteristics in determining the propagation of a flood wave. This study focused on circumventing the problems inherent in these traditional approaches, by employing an integrated (linked) modelling strategy, whereby each component of the physical system (storm surge, defence breaches, flood wave) is resolved with an appropriate (numerical or statistical) model. Output of water depths from a simulated 200-metre sea defence breach in the north of Canvey Island. Click to access Full results and summaries from this work. This study demonstrates that significant improvements could and should be made in the manner in which society manages its risk to natural disasters. The focus is on managing the physical vulnerability of residences (houses and flats) to flood disasters in coastal, eastern England. To complement the extensive knowledge of damage from slow-rise flood depth, this study examines the lateral pressure from flood depth differential between the inside and outside of a residence and flood velocity. The rate of rise of flood water inside a residence, to establish that pressure differentials could damage the residence. Analysis of glass failure, focused on large, low units in doors. Analysis of wall failure, focused on cavity walls of unreinforced masonry. The observations and calculations were applied to developing a new form of vulnerability profiling: two-dimensional "vulnerability matrices" with flood depth differential along one axis, flood velocity along the other axis, and the matrix cells displaying a damage outcome. The vulnerability matrices were used to illustrate possible disaster management tools. The "loss equivalent percentage" method of describing quantitative risk was presented for simulated storm surge scenarios on Canvey Island. Qualitative decision-making tools and analysis strategies for residence flood vulnerability management were also discussed. The results apply specifically to modern residences in England because those were the residences observed in the field surveys. The techniques and methods nevertheless could be used for similar analyses for other locations, other residence types, and other disasters. This study provides new knowledge and methods which contribute to understanding, describing, and managing societyâ€™s risk to natural disasters. 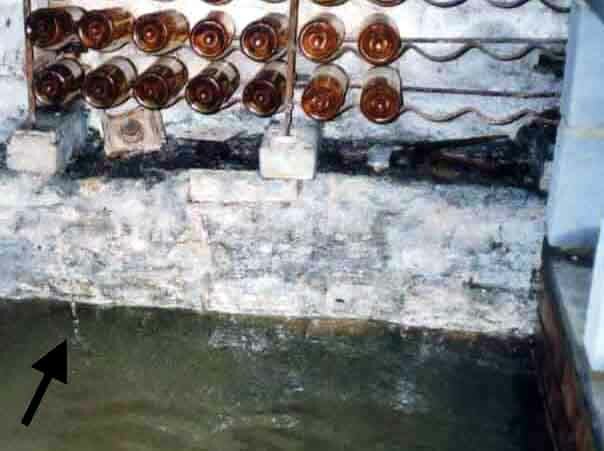 Water flowing through a hole in the masonry wall of the flooded wine cellar at Darwin College, Cambridge, U.K.
See Chapter 8 "Flood Rise Rate Inside a Residence". Summary in Word Format. (121 kb). Summary in PDF (92 kb in PDF). Extended summary in Word Format (526 kb). Extended summary in PDF (300 kb). Entire dissertation in Word Format (5,513 kb). Entire dissertation in PDF (2,836 kb). 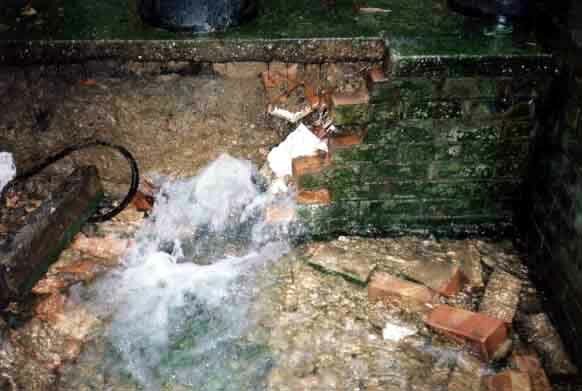 Brickwork wall broken from behind by flood water in Malton, U.K.
See Chapter 9 "Wall Failure". Zong, Y. and M.J. Tooley. 2003. "A Historical [sic] Record of Coastal Floods in Britain: Frequencies and Associated Storm Tracks". Natural Hazards, vol. 29, issue 1 (May), pp. 13-36. Table IIA in this paper does not mention the 11-12 January 1978 storm surge in Eastern England (see the photograph below) even though this event is mentioned in Table IIB for the South and Southwest Coasts of England. 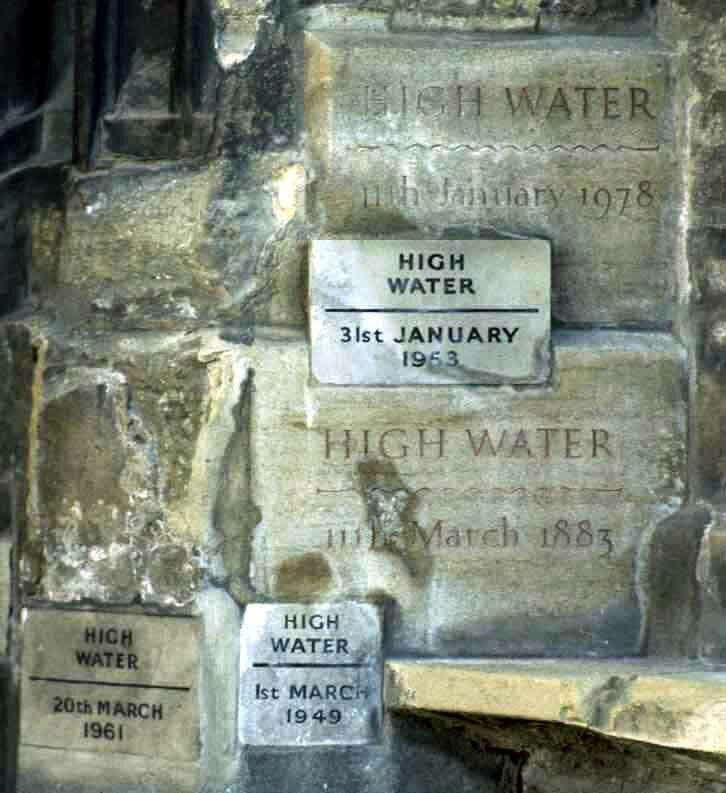 Plaques on St. Margaret's Church, King's Lynn, Norfolk indicating water levels from floods. The 1978 storm surge flood level was higher then the 1953 level, although the 1978 event was neither as destructive nor as lethal as the 1953 event. Kelman, I and R. Spence. 2004. "An Overview of Flood Actions on Buildings". Engineering Geology, vol. 73, issues 3-4 (June) pp. 297â€“309. The equation Cwater = Cair (rhoair / rhowater)n is not theoretically justifiable, although it is still a reasonable first-order approximation. The qualitative results, relative rankings, and overall conclusions of this chapter do not change, the quantitative results need to be revised. A theoretically-justifiable equation to convert Cair into Cwater cannot be determined. A useful approximation would be to assume laminar flow, rather than transitional flow, yielding Cwater = Cair (rhoair / rhowater)n (nuair / nuwater)2n-1 where n = 2/3. This approach does not immediately apply to all types of cracks in buildings through which floodwater would flow, yet further analysis indicates that it is acceptably valid for all cracks for first-order calculations. Although neither existing theory nor reported experiments perfectly explain floodwater crack flow nor entirely justify this suggested procedure, this approach is a helpful beginning. With thanks to Allan McRobie, Roger Nokes, and Robin Spence. The responsibility for any errors or misunderstandings remains with me. Kelman, I. and R. Spence. 2003. "A Limit Analysis of Unreinforced Masonry Failing Under Flood Water Pressures". Masonry International, vol. 16, no. 2 (Summer/May), pp. 51-61, abstract (35 kb in PDF) and full text (3,770 kb in PDF). Kelman, I and R. Spence. 2003. "A Flood Failure Flowchart for Buildings". Proceedings of the Institution of Civil Engineers--Municipal Engineer, vol. 156, issue ME3, pp. 207-214. This paper was awarded the James Hill Prize for the best paper published in the journal that year. Download the Revised version of the Flood Failure Flowchart (50 kb in PDF). Kelman, I. 2007. "Decision-making for Flood-threatened Properties". Chapter 1, pp. 3-19 in S. Begum, M. Stive, and J. Hall (eds. ), Flood Risk Management in Europe: Innovation in Policy and Practice, vol. 25 of the book series on Advances in Natural and Technological Hazards Research, Springer, Dordrecht, the Netherlands, abstract (16 kb in PDF). 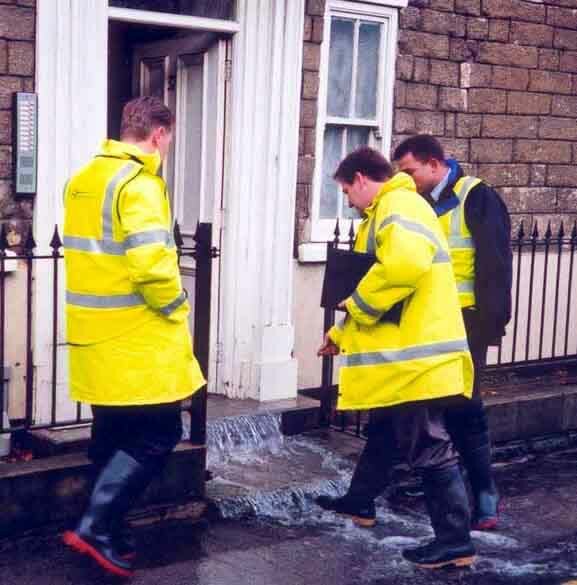 When a flood threatens an existing property such as a dwelling or business, the owner must decide what action to take to minimise the dangers, damage, and inconvenience. Extensive material is available related to options for managing the flood vulnerability of individual properties before, during, and after floods. These sources offer comprehensive information on the possibilities which exist but rarely develop tools for determining which option might be the most appropriate in given circumstances. 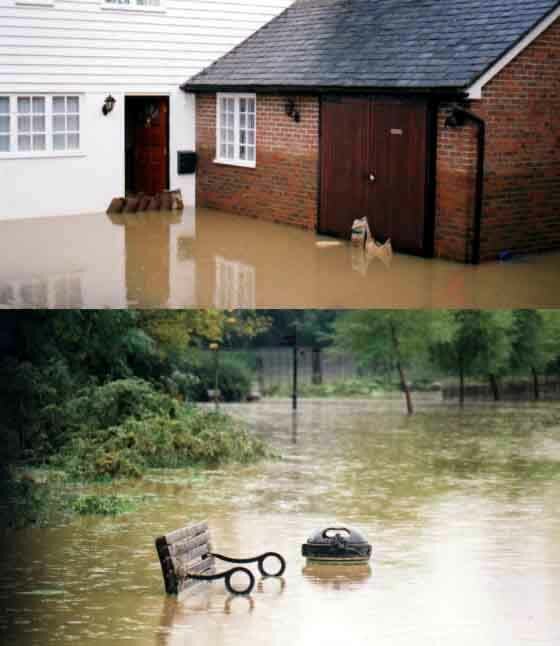 -Emphasising dry or wet flood resistance: to seal or not to seal an individual property? -Reducing recovery duration: should property components be removed from the property before the flood, replaced after the flood, or dried and cleaned after the flood? -Implementing resilient reinstatement: resilient reinstatement should be a social, not property-orientated, solution. Then, the implications for the wider community context are elaborated. The U.K. is used as the main case study. The discussion helps to consolidate available information in order to produce useful analytical approaches which any property owner could use. The key is to make each property owner their own expert rather than forcing them to rely on experts. Kelman, I. 2003. "To seal or not to seal: Do human and physical geographies conflict in flood management for individual properties?". Research paper presentation in the session "Geographical Solutions to Flooding Problems in the U.K." (convener Andrew Black) at Geography, Serving Society and the Environment, International Annual Conference 2003 of the RGS-IBG (Royal Geographical Society and The Institute of British Geographers), London, U.K., 3-5 September. When floodwater appears likely to reach an individual property, the occupierâ€™s tendency is to attempt to seal the property to keep the water out. 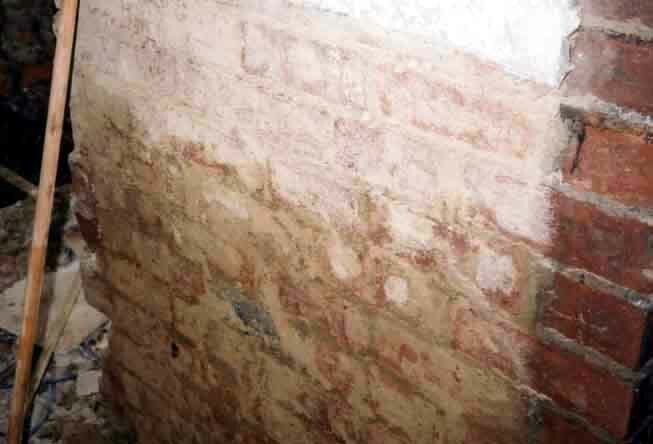 Engineering analyses of wall strength under floodwater loading were completed for modern residences in England assuming that a property is completely sealed. The results show that severe structural damage might occur when only 1.0-1.5 metres of water has risen outside a property. Protecting a property against such structural failure has more challenges than protecting a property from severe damage caused by floodwater entering the property. Therefore, the decision "to seal or not to seal" is influenced by the expected final level of the flood. An analysis of this decision-making dilemma indicates that, on a physical basis, increasing a residenceâ€™s internal flood resistance and always permitting water to enter the residence could often be the most appropriate solution. Whether or not occupants would accept floodwater entering their residence, and would adapt their lifestyle and properties to make this option sustainable, is a difficult sociological question. The human reaction potentially conflicts with the physical analysis. Admitting the strengths and weaknesses on both sides would assist in reconciling them. This research was reported in The Guardian by Paul Brown, 6 September 2003, page 13, and in The Telegraph by Graham Tibbetts, 6 September 2003, page 4. Thank you to both reporters for the time they spent discussing my work with me and for their articles which highlight the important issues arising from this research. Lewis, J. 1999. Development in Disaster-prone Places: Studies of Vulnerability. Intermediate Technology Publications, London, U.K.
Lewis, J. 1983. 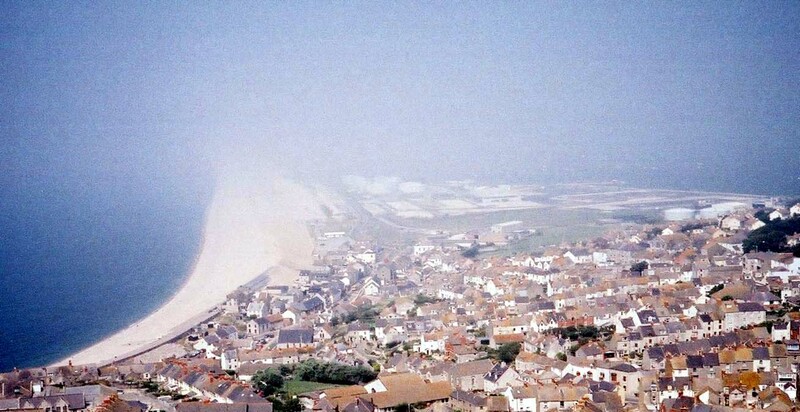 "Change and Vulnerability to Natural Hazard: Chiswell, Dorset". The Environmentalist, vol. 3, no. 4, pp. 277-287. Lewis, J. 1979. Vulnerability to a Natural Hazard: Geomorphic, Technological and Social Change at Chiswell, Dorset, Natural Hazards Research Working Paper 37, Natural Hazards Center, University of Colorado, Boulder, Colorado, U.S.A., full text (1,287 kb in PDF). Chiswell, Isle of Portland, Dorset. Another point of clarification is that the structural collapses in the 1952 Lynmouth flood were likely influenced by debris, mainly boulders and rocks, and waves from the flow. Quickly-rising and fast-flowing floodwater probably contributed, but a combination of factors tends to lead to building collapse, particularly in an event as complex as the 1952 Lynmouth flood. Different structures might have experienced similar damage from different factors. I would further like to emphasise that my work does not recommend to homeowners what they should do. Instead, it provides a way of thinking about the problem and of making decisions which factor in issues and concerns that have not before been properly addressed. Homeowners should inform themselves of the issues and make their own decisions, irrespective of what so-called "experts" such as myself state. For the U.K., the Environment Agency and the Scottish Environment Protection Agency are excellent sources of information and advice. Surfing their websites and phoning their Floodline at 0845-988-1188 is recommended as an immediate starting point--but only as a starting point. The National Flood Forum is also highly recommended as an excellent source of assistance and support (see Gill Holland's commentary immediately after this one). Do not wait until a flood threatens and ensure that you collect information from many sources so that you become the expert. For example, sandbags have advantages, such as filtering out contaminants in floodwater. Sandbags, though, also have many disadvantages, such as disposal--particularly if the floodwater is contaminated--and their weight and availability. This research suggests neither avoidance nor usage of sandbags. Rather, it indicates that each homeowner should investigate the advantages, disadvantages, and alternatives and make their own decisions about how to deal with floodwater. When making these individual decisions, care should be taken because one homeowner's decision can affect many other people. Ideally, long before a flood threatens, a community should get together, investigate the issues, discuss the possibilities, and make community-wide decisions. Thus, in the last-minute rush as floodwaters rise, neighbours can assist those who need help and conflicts will be minimised. In fact, this proactive, community, preparedness approach should be taken not only for floods, but for all potential community vulnerabilities including other natural hazard risks, crime, fire, traffic, and domestic violence. The concern is not simply minimising damage to individual properties from floodwater, but building and maintaining sustainable communities. Living in a society entails responsibilities to that society and making individual decisions which are good for both the individual and the community. See also Build on Floodplains (Properly) (231 kb in Word). 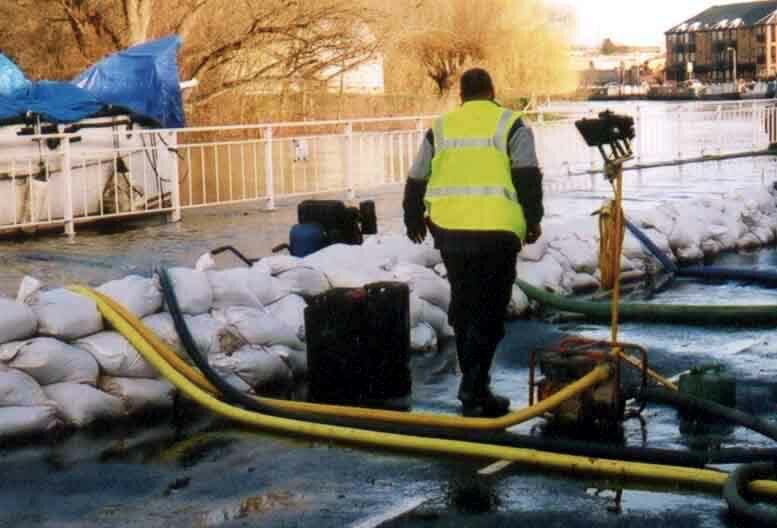 Sandbags are not a panacea, but might assist, as shown during floods in Cambridge, U.K. in 2001. Here, the sandbag barrier was complemented by pumps and trained personnel on-site for over 50 hours until the river's level diminished. For me, it's simple. I've seen familiar houses flooded, some of them frequently, admittedly only by water that rises gently through the floor as the whole river valley fills with water. In these conditions, it's virtually impossible to keep the water out of the house. The water will stand against the walls and under the floor for three, four, or five days. It's a good idea to keep the dirty water at bay with a piece of thick plywood, so that what's in the house is filtered through the walls and floor and is relatively clean. Using a pump is probably the only way you can damage your house (or your neighbour's) structurally in these circumstances. I've only found one house in the town that was waterproof. The lowest houses in Bewdley have been flooded over fifty times since 1923. They've probably gone through a good number of doors, skirtings and bottom steps of the staircase, which are the bits that go but otherwise they don't seem too bad. Obviously having water in your house doesn't do you any good--clearing things out of its way and cleaning up afterwards takes a lot of time and effort--but I haven't seen any major damage done by letting the floodwater in, given that you've adapted to that scenario. Plugs are just as convenient at waist or even chest height--better with small children or old people around. Plastic kitchen units with detachable doors are very much the same as the normal MDF units, or you can use solid wood as long as it's very well sealed all the way round, and that goes for skirtings and doors as well. The damage and expense is caused by the insurance company contractors ripping the gypsum plaster off the walls, which makes the place uninhabitable. Houses in Bewdley tended to have render on the walls instead, sometimes with a rail and then conventional plaster above. They had quarry tiles or paviours on the floors with the result that the walls and floors dried out gently with the occupants still using the rooms. I was entertained to find someone at a flood fair in Huntingdon who talked about trying to keep the water out of his cottage by pumping. The floor he described was obviously of tiles laid directly onto the soil where the water comes up through the floor and recedes that way too. He said that as they started to pump the water out the walls started to bow, so they stopped. On further questioning it turned out that it was a cruck house still with the original wattle and daub walls. All the research projects that I've been contributing to have put all the emphasis on keeping the water out. Yes, I think it's psychologically very difficult for people to accept that you should let the water in, and the instinct is to try harder and harder to keep the water out. At every meeting I say you're not looking at it from the right angle, but I'm always the only one taking that line. Tales From the River Bank, giving practical advice on preparing and recovering from a flood, by Fran Parry who has survived three floods in ten years (219 kb in Word). This project suggested methods for integrated strategies for modelling the physical vulnerability of coastal settlements to storm surge flooding. With the understanding of the losses which could occur for a given event, decision-making techniques for flood management and vulnerability management were suggested and the uncertainties in outputs were analysed. For further published results and extensions from this work, see Publications on flood issues. Apparent capillary rise in a flooded house in Keighley, U.K.
See Chapter 3 "Flood Actions".